Depression is a serious medical attention that afflicts millions of individuals worldwide. 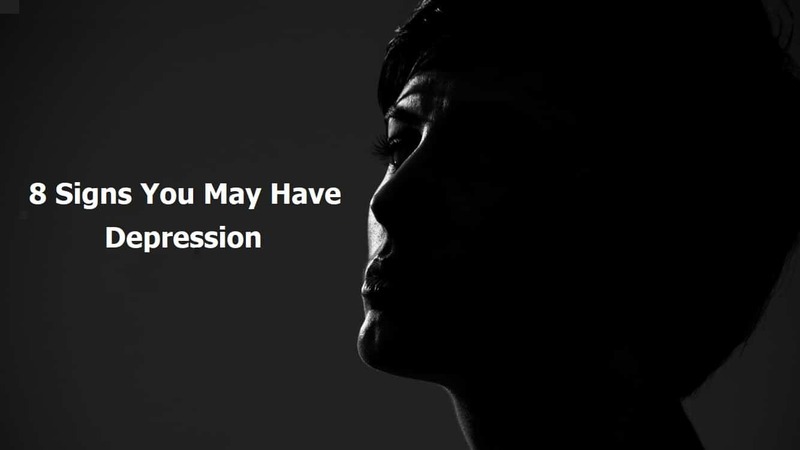 Contrary to popular belief, depression’s symptoms are not limited to feelings of sadness. In fact, the illness encompasses a wide range of symptoms – some of which are described below – that negatively affect everyday life. One of the essential aspects to understand about depression is that not everyone will experience the same symptoms. Depression is an enigmatic illness, and one that even the most brilliant medical minds don’t yet satisfactorily comprehend. Depression is also a very individualistic illness, and a symptom that arises or don’t arise often depends on each person’s brain chemistry. Furthermore, some people will experience one symptom while other’s more than one. Also, the illness will range in duration, from acute (short-term) to chronic (long-term). People may experience short or long episodes; take or not take prescription medication, etc. It is our sincere hope that the following list and description of eight common signs of depression may help someone understand their possible condition. Should you or someone you love suffer from such an illness (as this writer does), it is our intention to provide hope…even in such difficult circumstances. They call it “depression” for a reason, and that’s because it is, well, depressing. Occasional sadness is usually temporary and fleeting. Frequent, inexplicable feelings of sadness are a likely indicator of depression. Medical professionals believe that a chemical imbalance of the brain, specifically a lack of the neurotransmitter serotonin, is to blame for the frequent sadness that often accompanies depression. Doctors are more likely to diagnose a patient with depression if that person has frequent (daily) feelings of sadness over at least a two week period. Most people that suffer with depression have hobbies or activities that interested and engaged them prior to the onset of depression. The illness has a diabolical way of “clouding over,” or masking feelings of activities that once sparked feelings of engagement and joy. Those that experience this symptom generally have feelings of apathy towards activities that once created joy. Further, they generally recognize their newfound feelings of indifference to once-enjoyable activities. This symptom can be experienced in one of two ways: a noticeable tendency to eat more or a limited desire to eat at all. The former usually results in some degree of weight gain, while the latter predictably results in weight loss. It is not uncommon for those with depression to unintentionally gain or lose more than 5 percent of their body weight in a month. Similar to the third sign, this symptom is also experienced to one of two extremes: excessive sleepiness or excessive wakefulness. Depression effectively manipulates the chemical activity in the brain, including in regions that control sleep/wake cycles. As such, it is very common for those with depression to have either prolonged periods of insomnia or prolonged, frequent periods of sleep. Fortunately, natural remedies exist that can aid with re-attaining normal sleep patterns. An unexplainable lack of energy is another all-too-common symptom of depression. In attempts to regain energy, those with depression may attempt to sleep more, although this is a rather counterproductive measure that generally results in oversleeping. Fatigue is a far-reaching symptom of depression, affecting one’s emotional, cognitive, physical and social elements. One of the more tragic outcomes of depression is suicide – approximately 60 percent of those with depression have suicidal thoughts, of which about 15 percent take their own lives. 60 percent is quite a significant number, although unsurprising given depression’s often damaging psychological impact. Usually, those with suicidal ideations have low levels of self-esteem and an unnaturally distorted outlook on life’s prospects. The abuse of drugs or alcohol is often used as an escape mechanism for those that suffer from depression. Sadly, these individuals are in need or something…anything…that will relieve the continuous thoughts that are the source of distress, even temporarily. Most at risk are those that have an underlying substance abuse disorder combined with depressive symptoms. It’s worth mentioning that substance abuse can breed depression, and vice-versa.